gluten free food review – Get Cooking! I have a delicious relationship with CedarLane foods. Every now and then they send me a few of their new foods to sample and I love them muchly for this. Ironically, I’ve actually bought 10 times more (at least) than they have sent. 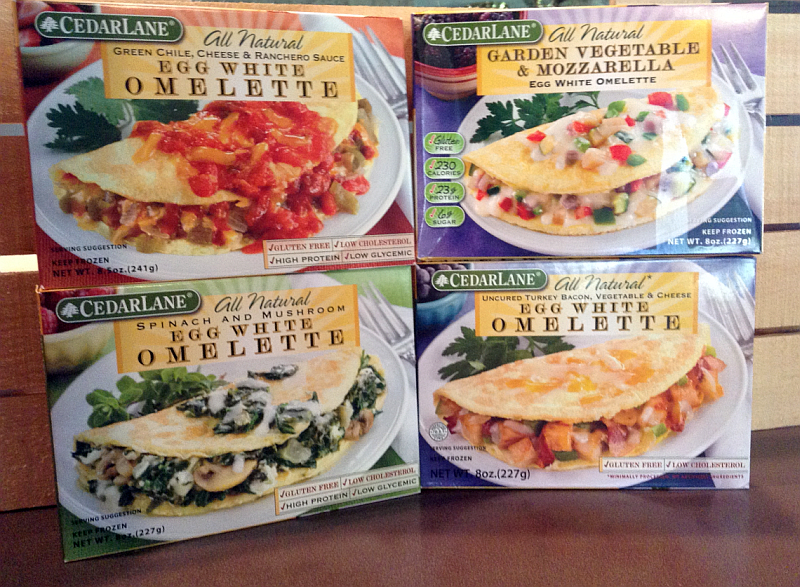 I throw more CedarLane meals into my cart than Aaron Rodgers throws footballs into the end zone. If I’m not mistaken, my first CedarLane review was one of their products that I buy at least twice a week: CedarLane Sweet Corn Tamales. “Delicious” doesn’t even cut it when it comes to these corn tamales. They’re quick, easy, ridiculously tasty (especially with salsa verde on them), and even fun to make and eat. One day in the grocery store, I saw CedarLane Roasted Vegetable Tamales and bought a box along with my Sweet Corn Tamales. I didn’t expect to like them as much as the Sweet Corn Tamales, but they were every bit as good. Seriously, the flavors are beyond belief. I now buy the vegetable tamales weekly as well. 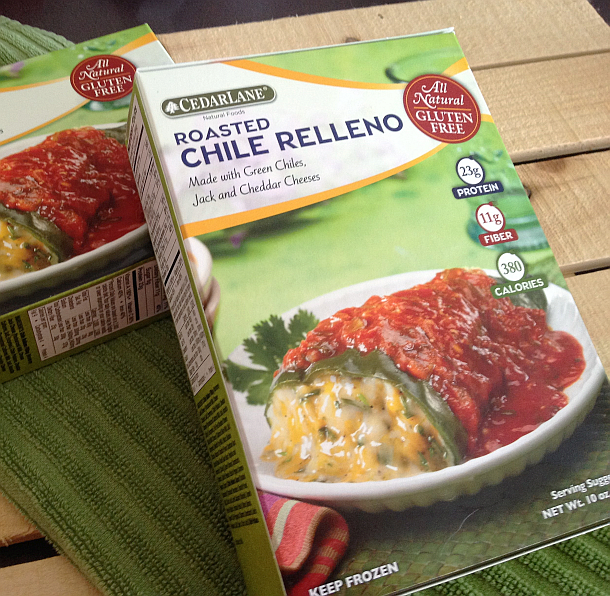 I’ve noticed on CedarLane‘s website that they have Chile & Cheese Tamales also – I haven’t seen these in a grocery store yet, but when I do, I’ll be all over them. 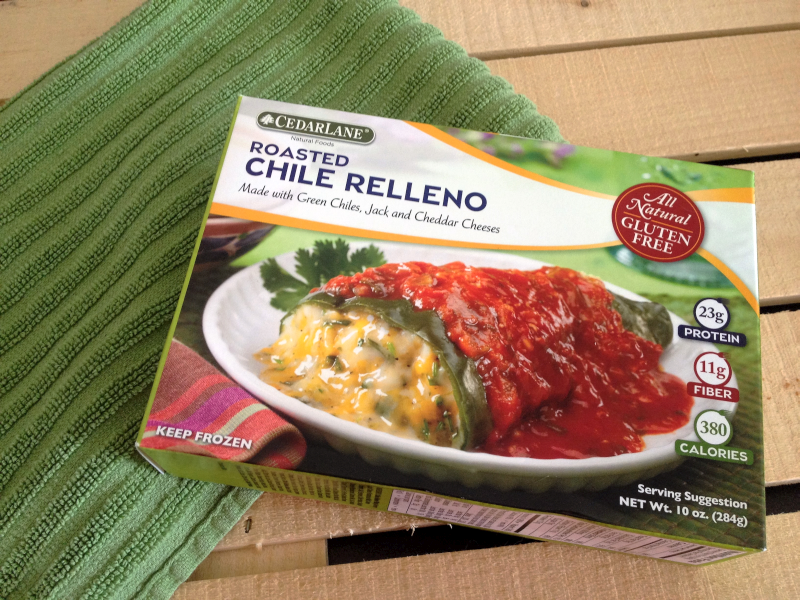 Another CedarLane favorite of mine is the STUPIDLY delicious Roasted Chile Relleno. My freezer always has at least two boxes of these in it. I’ll never forget the first time I tried this obsession – I nuked it, sat down at the table, took a bite… then looked at the box and said, “I can’t even with you.” Slang I picked up from my daughters which basically means my mind has been blown. 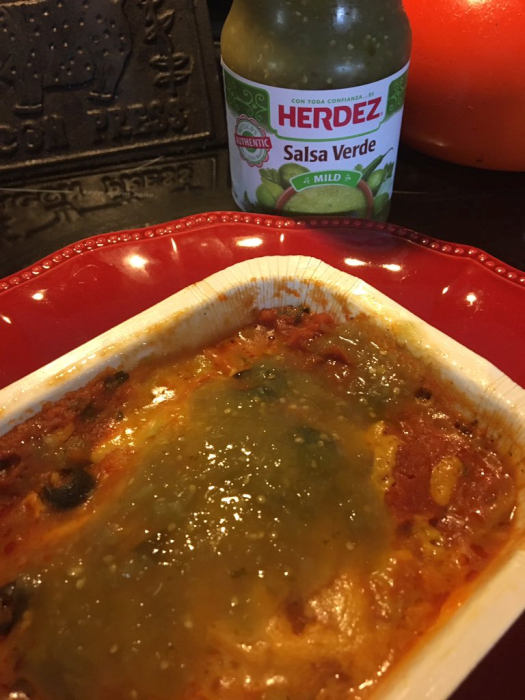 Three Layer Enchilada Pie with Salsa VerdeI branched out not long ago and tried the Three Layer Enchilada Pie and it was fantastic. As I do with many, many, many things in the kitchen, I added a little salsa verde to the top and it was a match made in foodie Heaven. A recent meal sent to me to review on the food blog is pictured above, the Baked Stacked Eggplant. Unfortunately, it isn’t gluten free, so I couldn’t personally enjoy it. I gave it to a son-in-law and he said it was fantastic AND that it’s something he’d buy. The fact that it’s quick and easy adds to the deliciousness of the meal, itself. This would be a perfect opportunity to remind you that not all CedarLane meals are gluten free. 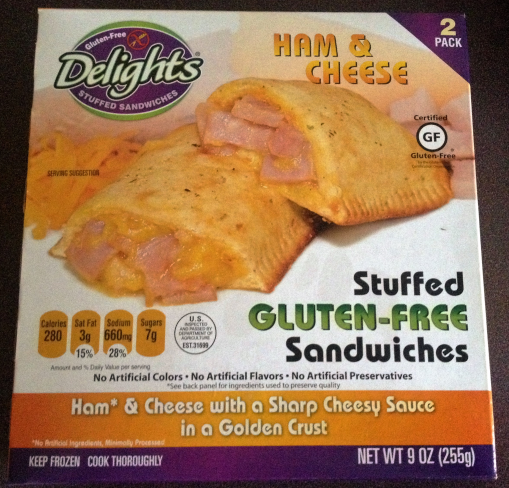 You have to always be dilligent (especially if you’re gluten-free for health reasons) and check the front of the box. 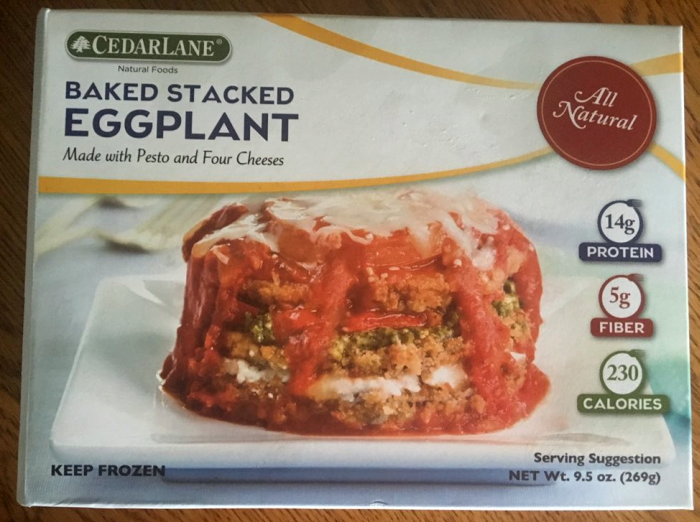 As you can see by looking at the pictures in this review, CedarLane makes it easy to distinguish which are gluten-free and which are not. I could not possibly recommend CedarLane foods enough. 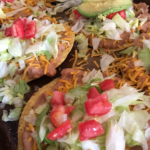 They are consistently delicious, very affordable, and make ideal quick & easy meals. I have them for lunch regularly and have even enjoyed them at suppertime. Paired with soup or a salad, they’re fantastic… and cleanup is a snap! See CedarLane‘s website for all the wonderful products available, nutrition information, and (most importantly) where to buy CedarLane meals. 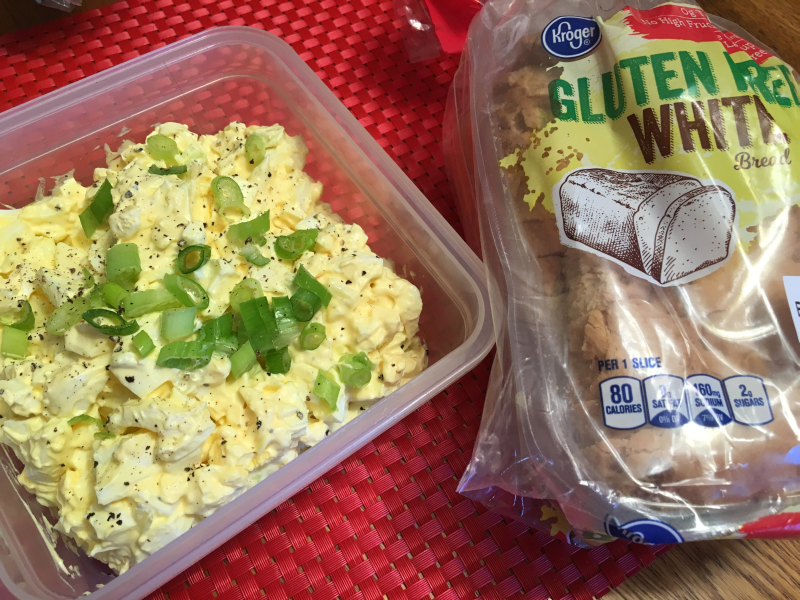 The BEST Gluten Free Sandwich Bread I’ve Found…..
… that is, until I tried a new brand a few weeks ago. I haven’t picked up another brand of gluten free since then! What is the magic brand that finally got it all right? KROGER! 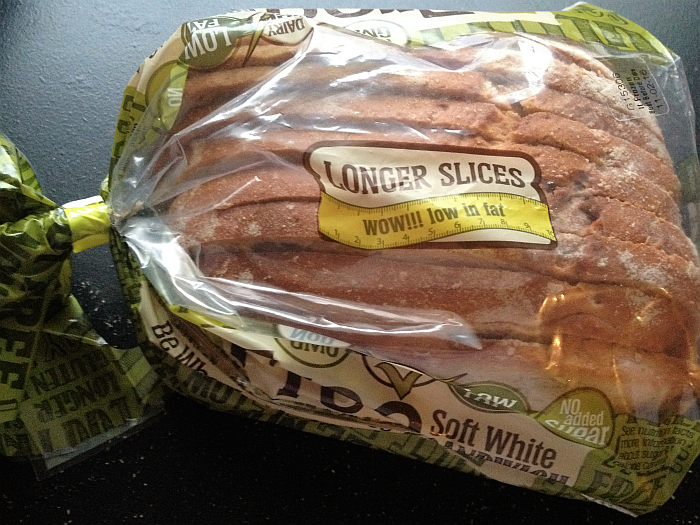 That’s right… Kroger Brand Gluten Free White Bread is the best gluten free sandwich bread I’ve ever eaten. Sandwiches are soft and fresh-tasting again. Those of us who eat gluten free have a solid understanding with gluten free bread – you have to toast it for anything remotely delicous. Kroger’s gluten free bread is soft enough to make a great, “normal” sandwich and you can leave the toaster on the shelf. Fast forward to today and… you guessed it.. I still want my sandwiches to fold. Old habits fold hard, I guess. Look at the picture above. What do you see? That’s right…. Foldy! Uh huh uh huh uh huh, life is good again. Problem is, most gluten free bread does NOT fold. In fact, if you even dare to try and fold it, it’ll fall apart right in the fold. I once told my cat that I think it’d be easier to fold a graham cracker than a piece of gluten free bread. 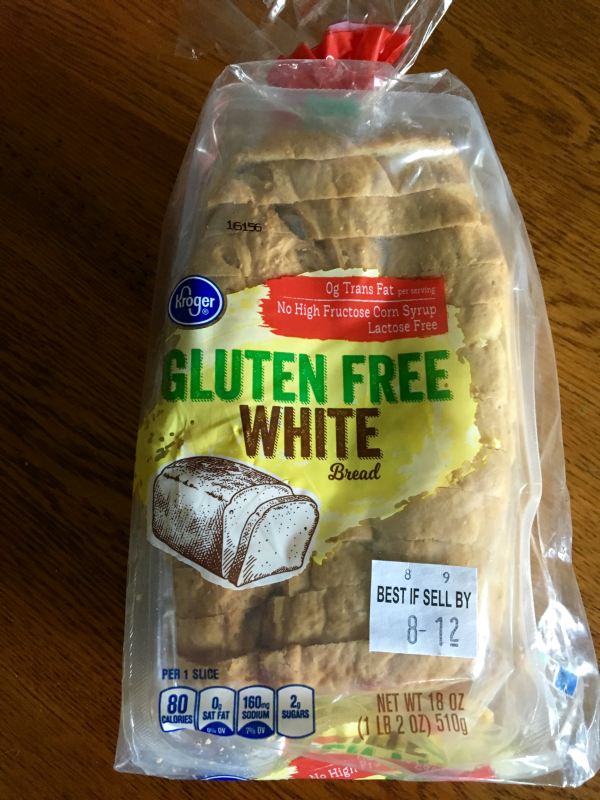 After I found Kroger’s Gluten Free White Sandwich Bread, I stopped buying any other brand. 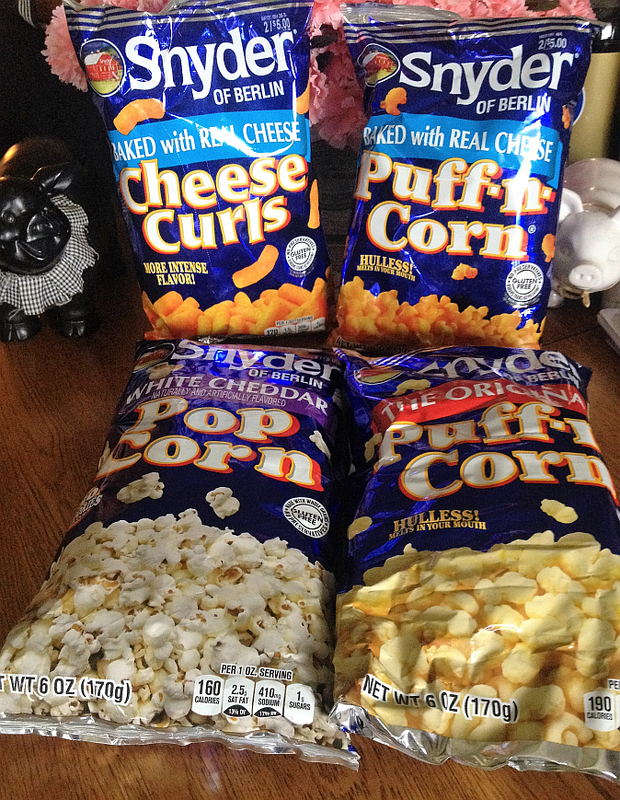 Kroger’s tastes better, looks better… it folds… it’s even cheaper than the rest. One day I wheeled right up to the spot and the white bread was sold out. 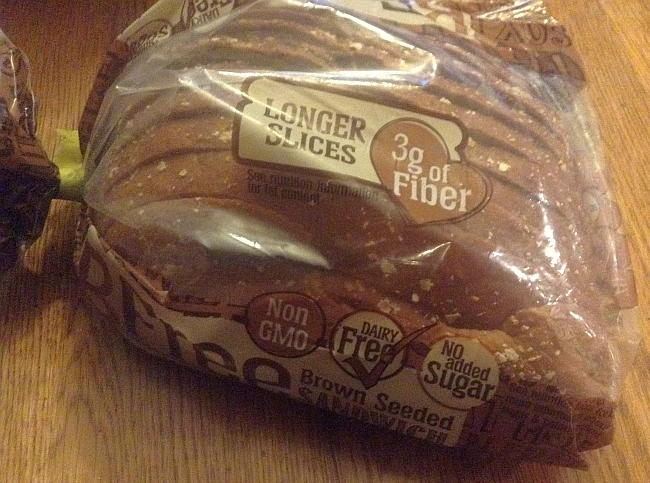 They had a few loaves of Kroger Gluten Free 7 Grain Bread, so I bought a loaf. It’s as good as the white sandwich bread – seriously, it’s out of this world good. And it folds, too! 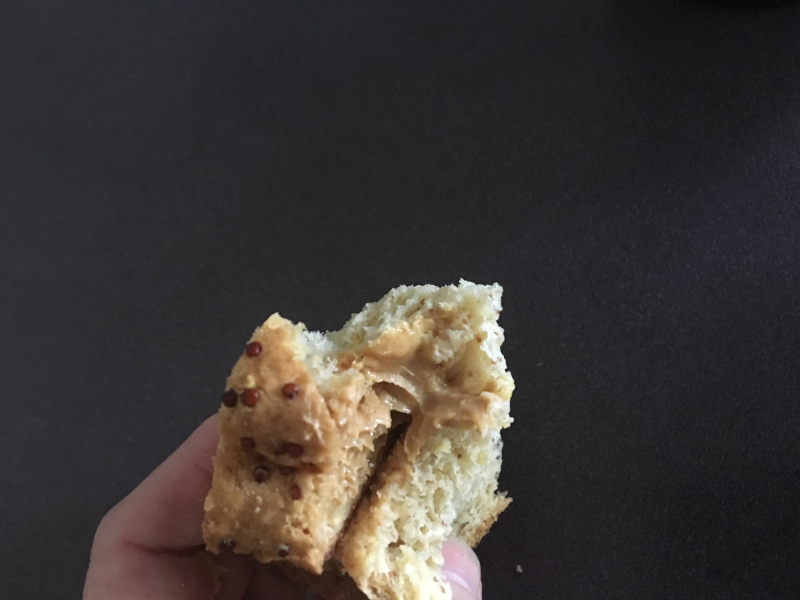 The 7 Grain Sandwich Bread is sheer perfection with peanut butter, chicken salad, and tuna fish. I 110% recommend both of these gluten free sandwich breads – they’ll blow you away. 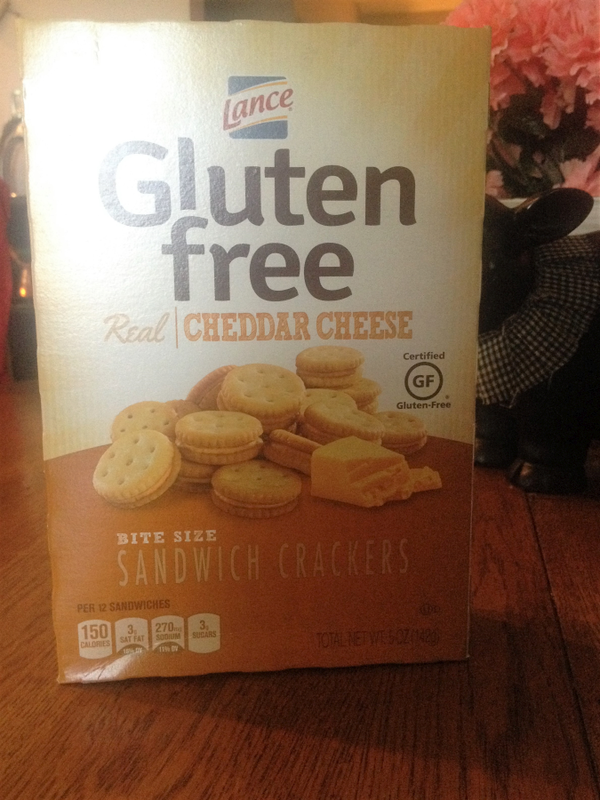 There are several brands in the gluten free world that I both love and trust so greatly you’d think they were family. Glutino is one such brand. When I had to give up gluten/wheat, my world was turned upside down. It was, if we’re being honest, kind of over-whelming. Can you imagine, eating a particular way all your life only to learn that the rules had suddenly changed? Fortunately, I soon learned that this new world wasn’t such a bad place. In fact, it’s downright delicious! Glutino is one of the names that helped me the most in the transition and they’ll always have a special place in my gluten free heart for that. Their Toaster Pastries are out of this world and do more than just taste delicious – they give a nostalgic little nod to bygone days. Frankly, I love nostalgic little nods to bygone days. There’s something familiar and comfortable about these beautiful and outrageously tasty pastries. I’ve had the frosted blueberry (pictured here), apple, and strawberry and have gotten them both frosted and un-frosted – it all depends on my mood… that and what the store has on the shelf. At least, it used to depend on what the store had in stock. Now that I’ve found them on Amazon (also available in a variety pack, no less! ), I can stock up. 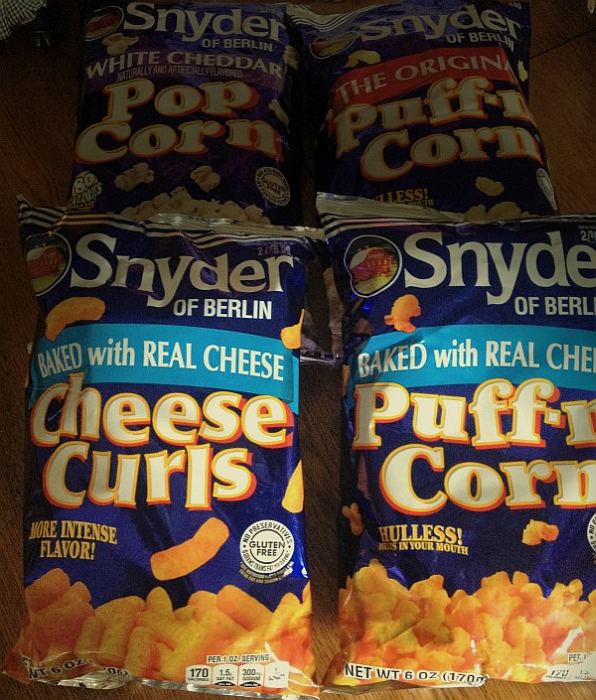 Before Meijer came to town, Wal-Mart was the only place I could find these little beauties – now I have options. Options are the bee’s knees. 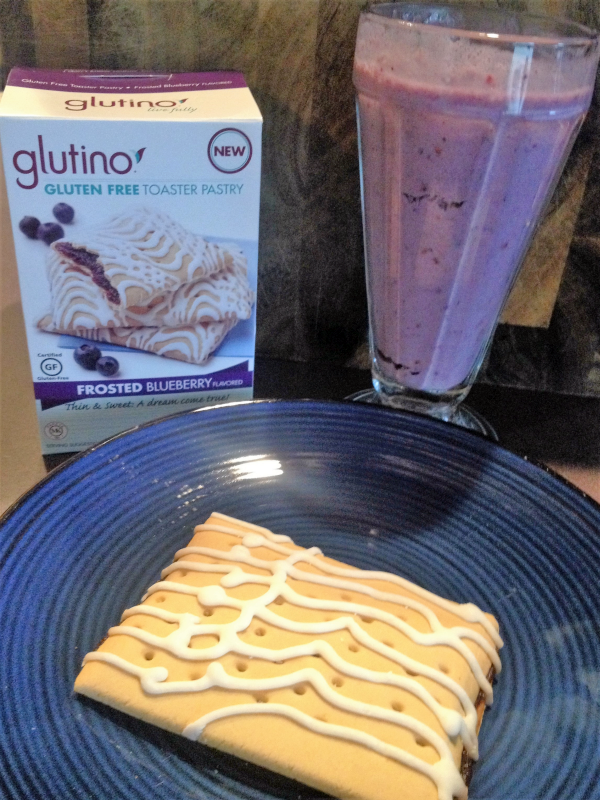 Glutino’s Toaster Pastries make delicious snacks, quick and light breakfasts, and desserts when warmed and topped with a scoop of vanilla ice cream. The Apple variety begs for the dessert approach! 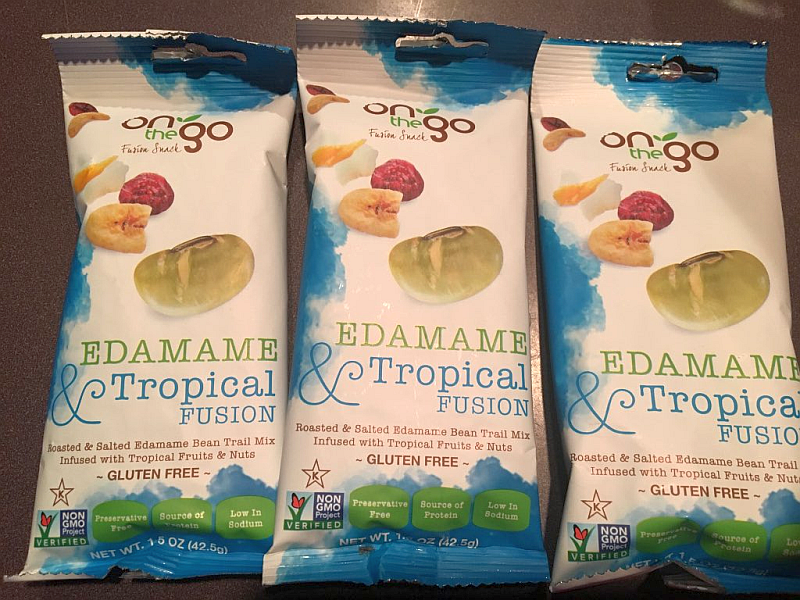 Look for these delicacies the next time you’re in your favorite store or head over to Amazon and stock up. 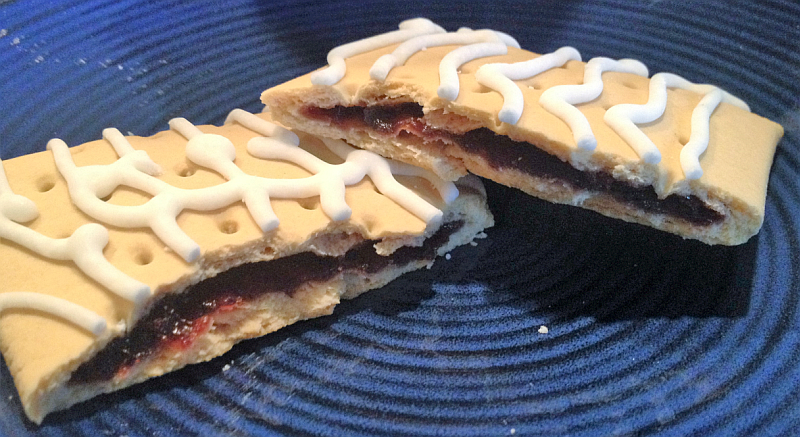 They are even more delicious than the toaster pastries they give a nostalgic little nod to. 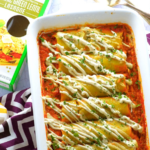 In past gluten free food reviews, I’ve told you how much I LOVE, LOVE, LOVE CedarLane Quinoa and Vegetable Enchiladas and CedarLane Sweet Corn Tamales (you can click the links to read the reviews). I actually just had one of their Sweet Corn Tamales for lunch. Not a huge surprise, of course, since it’s one of my absolute favorite lunches. I’ve always topped these tamales with Salsa Verde but today, after discovering that I was out of salsa verde (the horrors! ), I used Pace Picante Sauce instead. WOW! Delicious. I’m going to have to switch up between the two from now on. 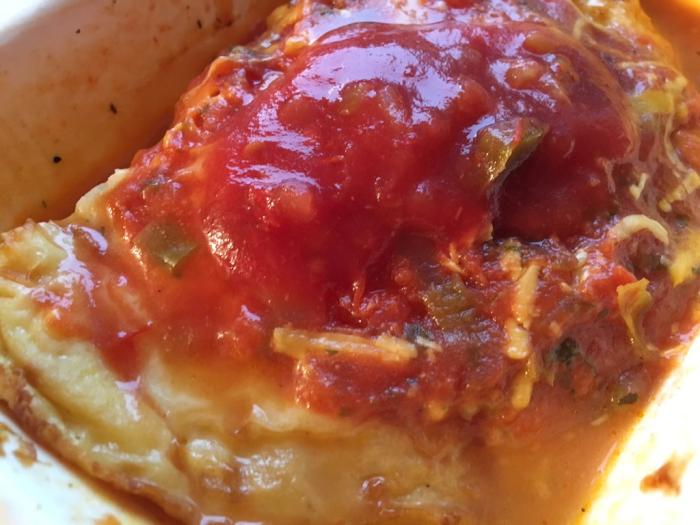 Another “regular” in my house – for supper as well as lunch – is CedarLane’s ridiculously delicious and downright beautiful Roasted Chile Relleno. I’ll have a review up of this beauty soon – it’s phenomenal. Given my perfect history with CedarLane (they do no wrong). when I heard that they were entering the frozen breakfast food business, I eagerly jumped at the chance to try them out. After all, who doesn’t want something quick, convenient in the morning?! CedarLane’s Breakfast Selections include Green Chile, Cheese & Ranchero Sauce Egg White Omelette, Garden Vegetable & Mozzarella Egg White Omelette, Uncured Turkey Bacon Egg White Omelette, and Spinach and Mushroom Egg White Omelette. The first one I tried was the Green Chile, Cheese & Ranchero Sauce Egg White Omelette (pictured above). Even though I had supreme confidence in CedarLane, I have to admit that I was a little worried about how an egg product would “behave” in the microwave. I was shocked – it was excellent.. it behaved far better than I could have hoped for. 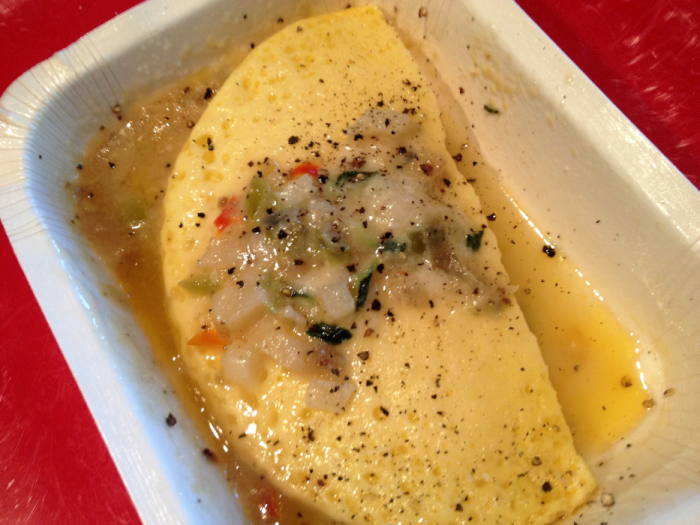 This omelet is delicious on its own but I did add a little Pace Picante Sauce on top just for good measure. 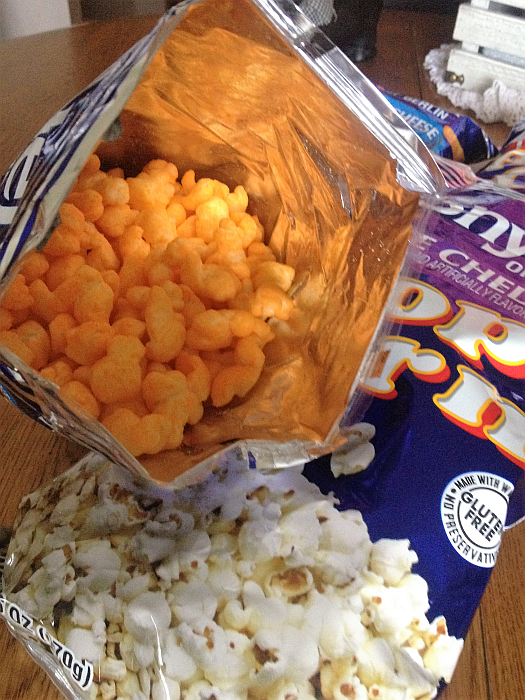 But, again, it’s perfectly great as is because it comes with so much flavor, right out of the box. See what I did there? The green chile and Ranchero Sauce give the omelette so much wonderful flavor, you just savor each and every bite. Omelettes are one of those breakfast foods that everyone wants but hardly anyone wants to make. Frankly, most of us simply don’t want to do much of anything early in the morning – outside of drinking coffee and getting dressed (and then, only if we have to). CedarLane allows you to have a yummy breakfast in less time than it takes to drink your cup of coffee. I’ve also tried the Garden Vegetable & Mozzarella Egg White Omelette (pictured below). I actually got the pictures backward yesterday – I apologize for that! The Garden Veggie Omelette is also delicious. When I tasted it, the first word I thought of was, “Fresh!” It simply tastes fresh and wonderful. Great flavors! Garden Vegetable & Mozzarella Egg White OmeletteBoth of these omelettes were perfectly filling. I didn’t eat anything with them, but a few pieces of bacon and/or toast would certainly make great co-stars. I have not yet tried the Uncured Turkey Bacon Egg White Omelette or the Spinach and Mushroom Egg White Omelette, but I will devour one tomorrow morning. After I taste these last two, I’ll come right back here to this post and tell you all about them. See CedarLane Foods for more information about their company and their delicious products. The gluten crowd takes bread for granted – they really do. White bread, whole wheat bread, sourdough bread, biscuits, rolls, croissants,bagels, English Muffins… they have so many delicious options everywhere they turn. I was in Wal-Mart a few days ago and the entire front of the store looked like a huge, glorious bakery. 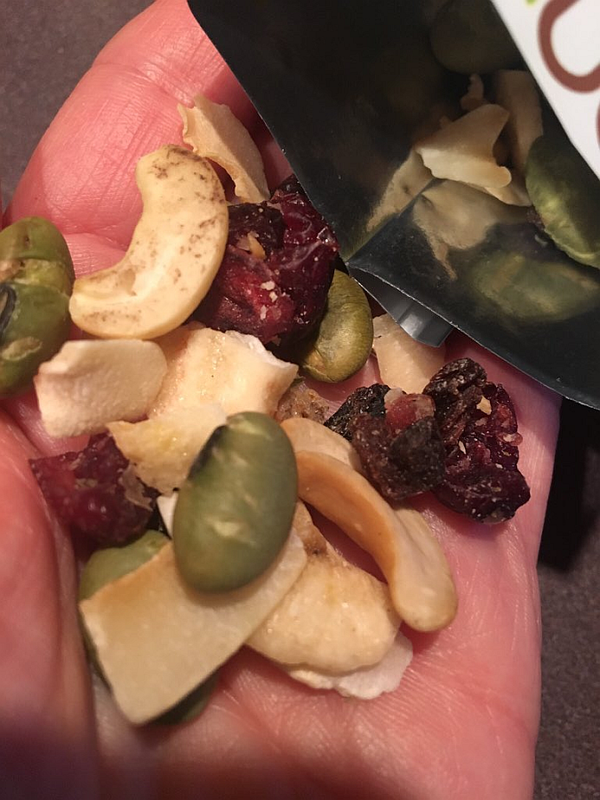 I’d recently been accidentally glutened (back to back, within 10 days of one another – MISERY), so I hot-footed it through the section, not wanting to take any chances of a random crumb dive-bombing me. This end of the crumb spectrum is an entirely different ballgame. The gluten free crowd has a pretty ugly history when it comes to gluten free bread. … and I mean ugly in every sense of the word. 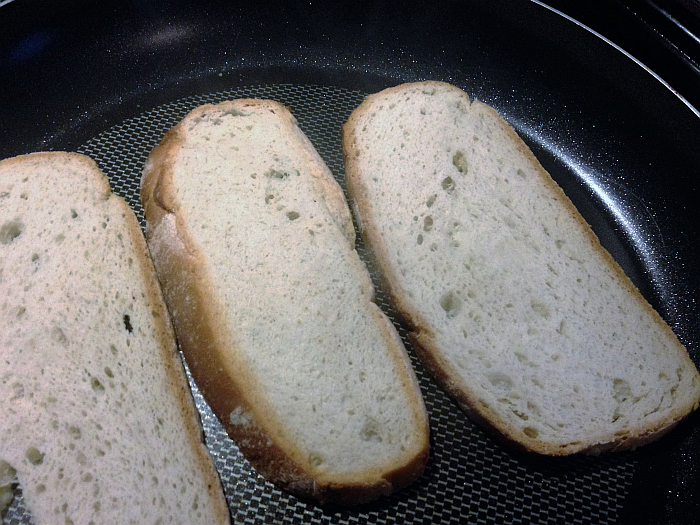 Flavorless, stiff, dubious white slabs of something or another have long tried to pass themselves off as bread. A lot of us simply added great bread to the list of “we’ll never haves” – right next to great store-bought doughnuts. I’d love to see a company pull that one off! However, times… they are a’changing. More and more great gluten free bread is hitting the market and we have something we’d all but given up on… BREAD CHOICES! I was recently sent some beautifully-packaged gluten free and wheat free bread loaves from BFree and they honestly made me realized how much I’d missed bread. Brown Seeded Gluten Free Sandwich Loaf – Delicious bread made with a special blend of flours, starches, proteins and fibers with sunflower seeds and golden linseeds that give it a wonderful texture I quickly became obsessed with. The BFree Brown Seeded Gluten Free Bread is unlike anything I’ve had in a very long time. It’s exceptionally flavorful and the texture is a beautiful, beautiful thing. White Gluten Free Sandwich Loaf – The soft and perfect white sandwich bread is also made from a unique blend of flours, starches, proteins and fibers and has a “real bread” texture that’s very exciting to find. 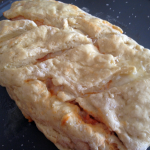 This bread is free from egg and dairy as well as gluten and wheat. Both loaves are sliced lengthways to give a bigger and better sandwich slice – producing what I think of as “fancy-looking” sandwiches. I can be quite the food snob sometimes. These larger slices also make the most perfect French Toast, Garlic Toast, and Grilled Cheese sandwiches you ever had, too. Neither of these breads taste like, “Gluten Free Bread,” they taste like, “Bread,” period. And isn’t that the point? They weren’t filled with holes, like they were going as Swiss Cheese to a Halloween party and they didn’t look like a pasty white tile my husband was fixing to use on the bathroom floor. Look like bread. Taste like bread. EVEN smell like bread! If I sound excited, it’s because I am. The gluten free crowd takes nothing for granted – we’ve learned that lesson the hard way. If we tend to get worked up or uncommonly excited about certain food, it’s because finding something we can both eat and enjoy is cause for celebration. 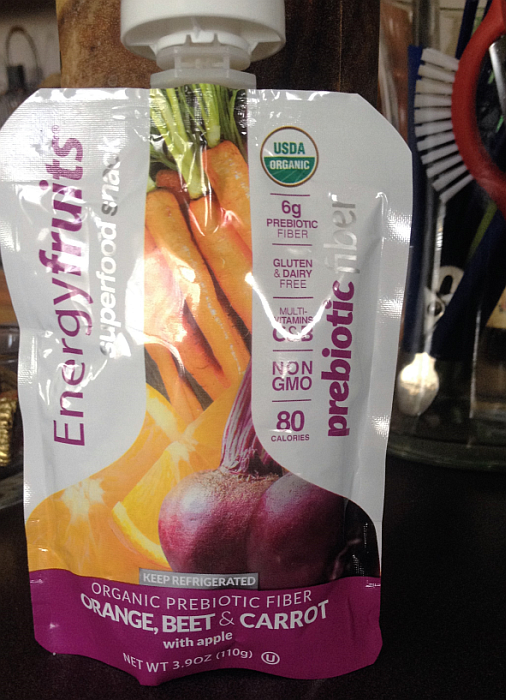 BFree is obviously named for the fact that the consumer can “be free of” wheat and gluten. However, as far as I’m concerned, it carries a “double meaning” because it also allows the consumer to “be free from” restrictions we’ve had for so long. We can “be free” from settling for bread that tastes like anything BUT bread. We can be free from “wishing” for breakfast sandwiches on bagels or rolls with supper. 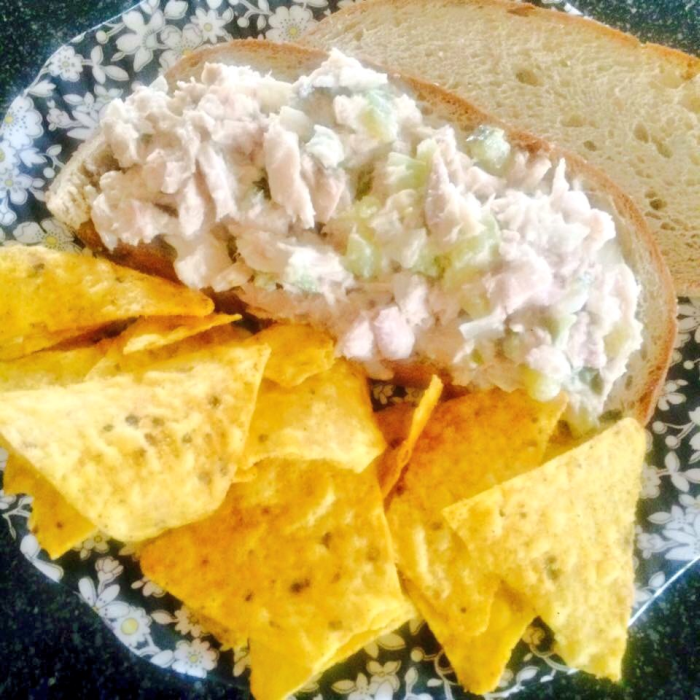 We can be free to eat a tuna fish sandwich (like the one my daughter, Emily, made in the picture at the top!). 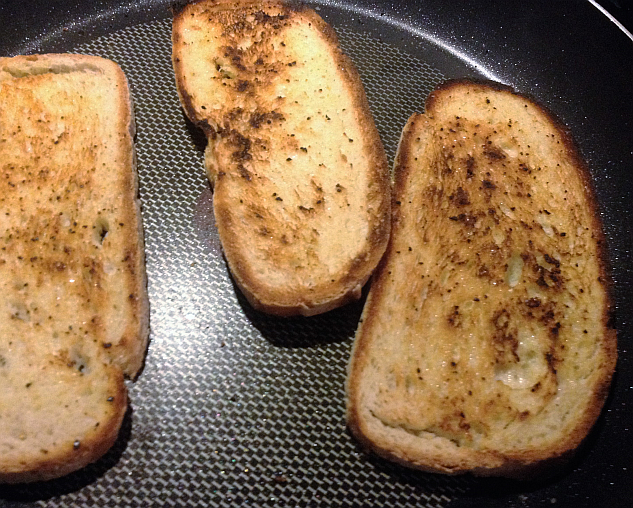 While I loved using both varieties of the gluten free sandwich bread for traditional sandwiches, I used the white bread more for garlic toast, French Toast, and grilled sandwiches. With these big, beautiful slices, my favorite way to serve them was to “pan toast” the slices. 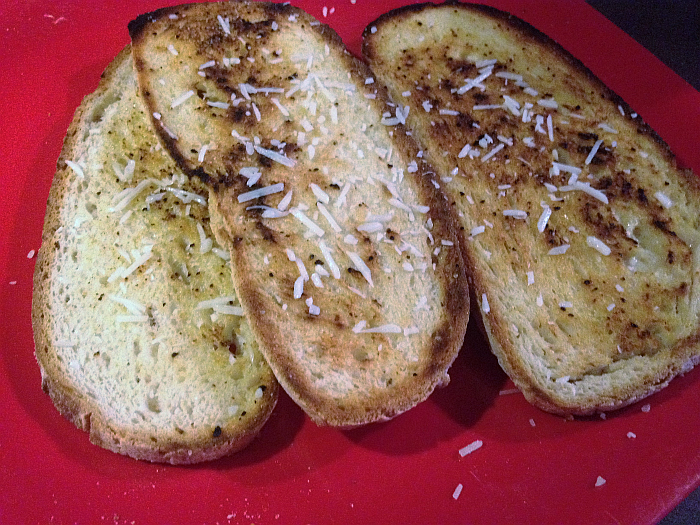 I smear one side with butter and add garlic salt or garlic powder, then toast it in the pan until it’s nice and browned. I flip it over so the other side doesn’t feel left out. 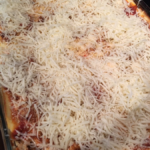 I usually finish it off by grating a little fresh Parmesan Cheese on top. Ideal for spaghetti, soup, lasagna, or even salad. The BFree Gluten Free Brown Seeded Sandwich Bread is absolute Heaven on a plate when used for chicken salad sandwiches. My mouth is watering right now just remembering what a delicious pair they made. I’ve said it before, but it’s worth repeating – the flavor and texture of BFree gluten and wheat free breads are remarkable. As I said in my other BFree Reviews, the packaging on each of their products is gorgeous. I’m not sure why packaging matters so much to me, but it always has. Maybe it’s the girly girl in me, or maybe I just appreciate it when people have enough pride in what they’re doing to do ALL parts of the process as well as they can be done. Maybe I just love pretties. Whatever the case, everything BFree does is exquisite. 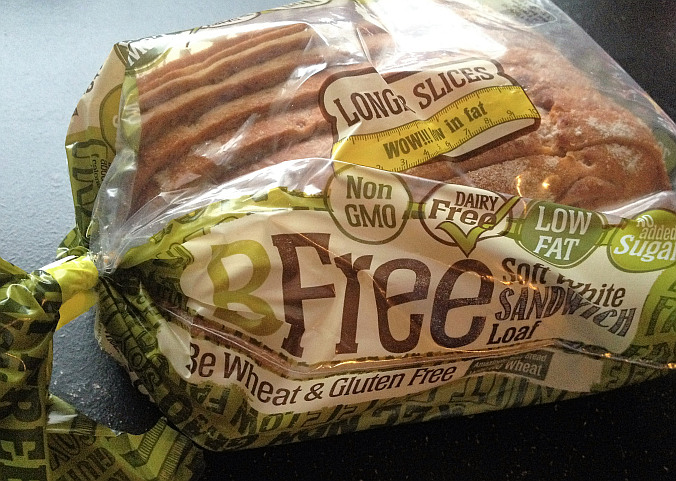 BFree Wheat and Gluten Free Breads can be found at Meijer’s stores as well as other select stores around the country. See the store locator for more information. 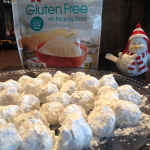 Read more about BFree Products on their website and watch for more reviews soon here on Get Cooking! A few days ago, I tweeted a picture of a dancing baby and titled it, “When you find something new that’s gluten free!” I thought that summed it up pretty well. 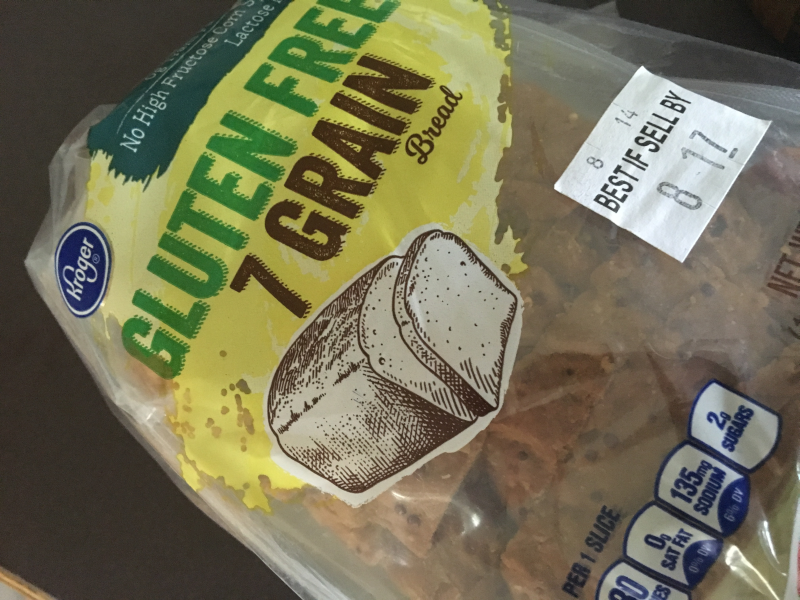 When (for health reasons) you have to eat gluten free, it’s a special kind of thrill to find a new gluten free food – it’s an even bigger thrill to discover an entire new line of gluten free food! They’re kind enough to trust me to do right by them with a review. I always appreciate trust like this greatly and strive hard to live up to it. I’m impressed by the confidence a company has in their product when they offer it up for reviews. That’s serious confidence! Fortunately, it’s been my experience that companies that seek reviews are confident for a good reason. They’re on to something special and they know it. 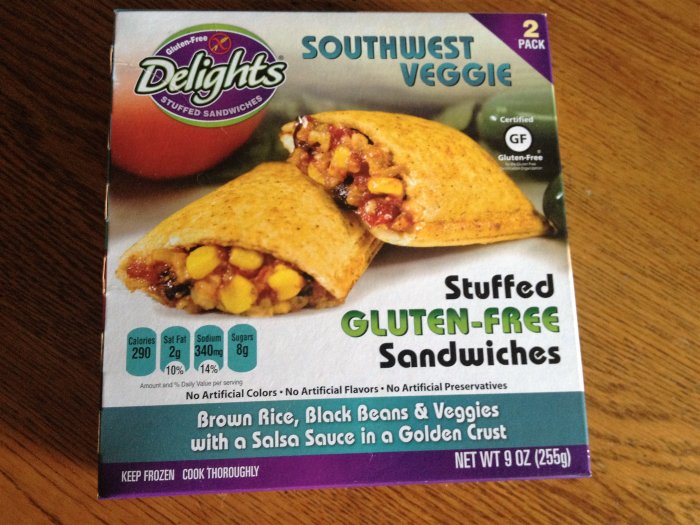 The first gluten free sandwich I tried was the Southwest Veggie. I had a delicious fresh batch of salsa and thought it’d make a perfect dancing partner. Great call, me, great call. Everything about this stuffed gluten free sandwich was delicious. The rice, beans, and veggie filling was delicious and the bread it filled may have been even more delicious. It was extraordinary and I was VERY glad the filling didn’t overwhelm it. 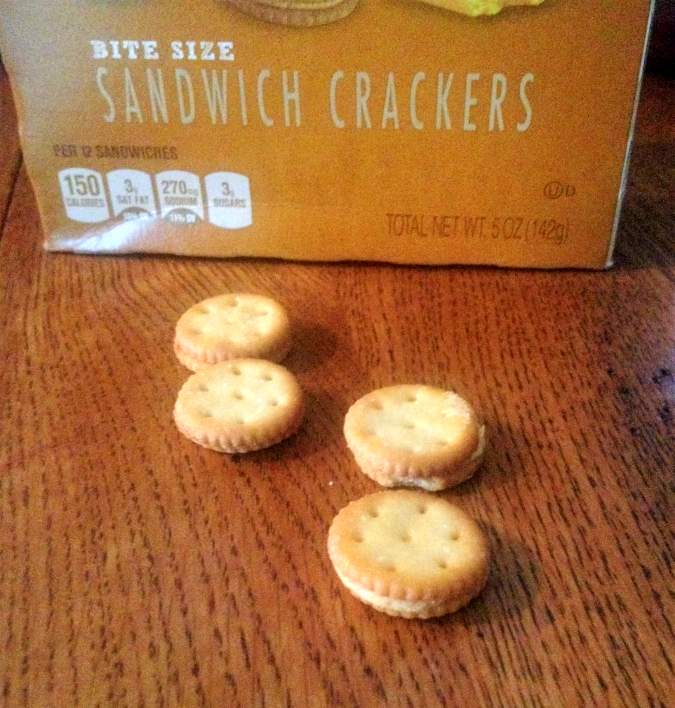 There was a perfect amount of filling, too, which made eating the sandwich like a… well… sandwich possible. No fork necessary. The next one I tried was the Ham & Cheese stuffed gluten free sandwich – with a pot of potato soup. Again, a match made in Heaven. Like the Southwest Veggie, the Ham & Cheese sandwich had the perfect amount of filling – plenty to taste, but not so much that it spills out all over you when you try to eat the sandwich. Also, like the Southwest Veggie, it was very delicious and fun to eat. All of the Delights stuffed sandwiches would make great lunches or dinners but these two stuffed sandwiches would also make great brunches or even breakfasts. 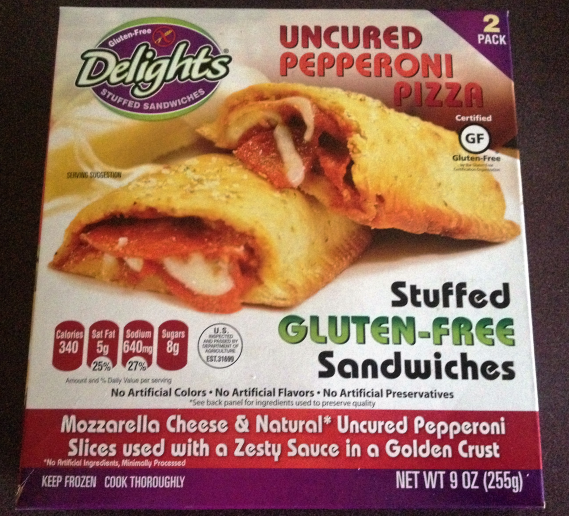 The Pepperoni Pizza Stuffed Gluten Free Sandwiches will be a HUGE favorite with kids – and adults, too, for that matter. 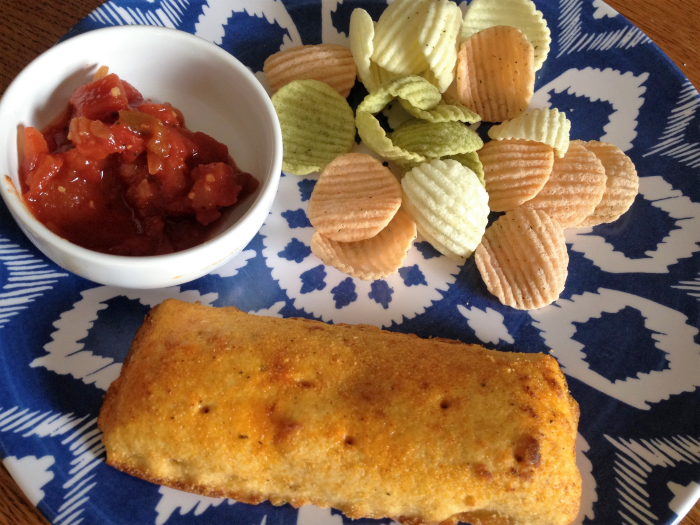 Paired with a salad or even Ruffles chips, they make an ideal quick and easy lunch. I’m not even that wild about pepperoni and I loved them! As was the case with all of the sandwiches, I was amazed by how great the crust was. Seriously, you’ll forget every other bread or crust you ever met. But the thing that really seals the deal for the Pepperoni Pizza Stuffed Gluten Free Sandwiches is the SAUCE. It smells, and even more importantly tastes, just like the old school pizza restaurants that we all remember so fondly. Back in the day, pizzas simply tasted better than they do today and the secret was the sauce. This. Is. That. Sauce. All. Over. Again. It was something I never had to worry about because they were as good as the rest. Amazingly good, in fact. I make a killer – and I mean killer – spinach artichoke dip, and these sandwiches remind me a great deal of it. So much flavor! The cheese sauce in the Spinach Artichoke Stuffed Gluten Free Sandwiches was more delicious than it had a right to be and I told it so. More than once. These sandwiches each carry the Certified Gluten Free symbol – something I religiously look for. I don’t take any chances when I buy groceries. I look for this symbol on every packaged food I buy. If I don’t see the symbol, I don’t buy the food. I want to KNOW that I can trust a product to be gluten free and this symbol sets my mind at ease. These delicious stuffed gluten free sandwiches make great meals year-round, but are all but custom made for summers. You can have a quick, easy, delicious, and gluten free meal in your family’s hands within minutes. I hope you’ll check these sandwiches out – I know you’ll be as impressed as I am. 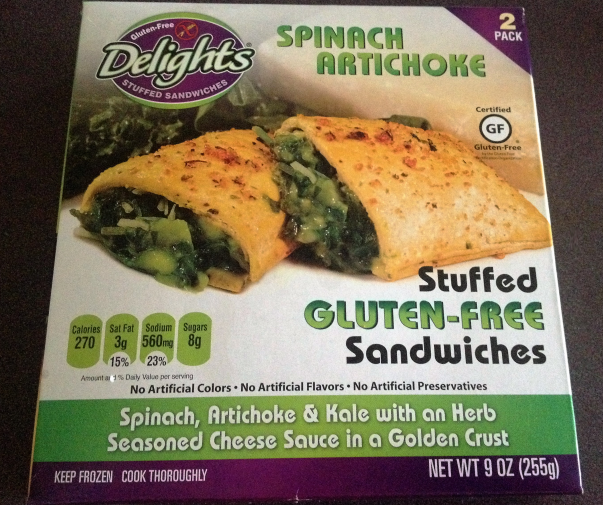 Where can you buy Delights Stuffed Gluten Free Sandwiches? You can find them quickly and easily on Amazon (click the link to see how easy it is!) I’ve linked several of the sandwiches above to their own page on Amazon. You can also use the store locator on their website to see if they’re offered near you. I will need to use Amazon (and I will!) because they aren’t available anywhere near me. Yet. EDIT: In addition to being sold on Amazon, they are also available at Piggly Wiggly, Jewel-Osco and many independent food stores. 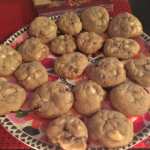 Find them… it’s worth the drive…. ANY drive! 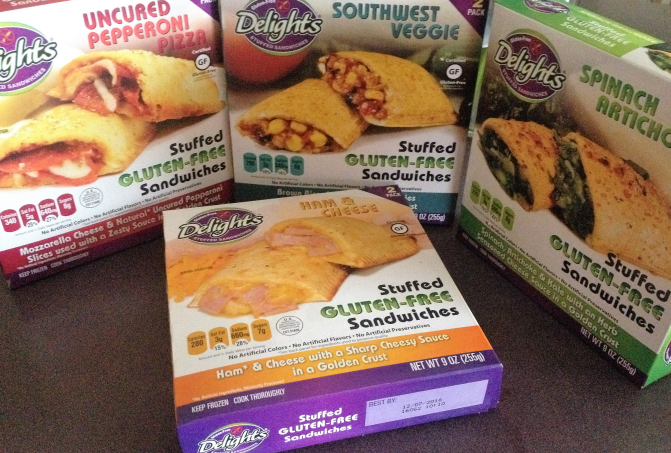 Follow Gluten Free Delights on Facebook and Twitter to stay up to date with their products.